ZOOLOGY. Of coloration, markings, etc: serving to warn or repel. It's well known that if a creature is particularly brightly coloured, it's probably best left well alone. This system of defense is called aposematism and is unusual in being mutually beneficial to both predator and prey. It's most common in invertebrates, such as insects, but is also a mechanism seen in reptiles, amphibians and fish. There are a few examples of mammals employing aposematic markings, the skunk perhaps being the most famous. Interestingly, it's believed that predators don't necessarily have any inherent understanding of aposematic markings; I had always assumed they did, and instinctively knew such markings meant trouble. However, it's thought that aposematic markings merely serve as a mnemonic device for the predators. 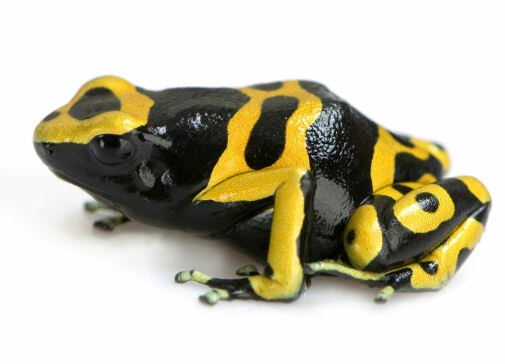 Having once had a little nibble on a black and yellow Poison Dart frog and found it to be thoroughly disagreeable, the predator will think twice the next time he sees one, thus sparing the frog the indignity of being chewed and spat out, and the predator the agonising stomach cramps for hours after. Aposematism doesn't just show that a creature is poisonous, incidentally. It can also warn (or a remind) a predator that an animal tastes disgusting, has a fearsome weapon (such as a wasp), or just plain stinks (thinking of the skunk again). There is also a field of research that suggests humans, in their past, may have displayed aposematic markings or behaviours in a similar fashion. I'm no anthropologist, but in the video below I present MC Hammer and his undeniably aposematic trousers. As a species we toyed with them the 1990s, like a snake taking its first tentative taste of a Poison Dart frog. Now, however, we can barely look upon their garish bagginess without feeling a hot wave of nausea, and in this regard they serve us dutifully.